Look, a picture from Aquaman with minimal water! Christopher Lloyd is game for a fourth Back to the Future film. The Walking Dead recruits another time-skip character from the comics. Danielle Panabaker will head behind the camera for The Flash’s next season. Plus, a new look at Fear the Walking Dead’s return, and what’s to come on The 100. To me, my spoilers! Speaking with the Phoenix New Times, Christopher Lloyd revealed he’s game to return for a fourth Back to the Future film. I’d be delighted. I’d love to be in a fourth film, if they could come up with the right idea that extends the story and does it as well as the first three. Freddy Freeman meets Shazam and his very glowy chest in a new image from Entertainment Weekly. “It’s completely dried out!”, says Aquaman. 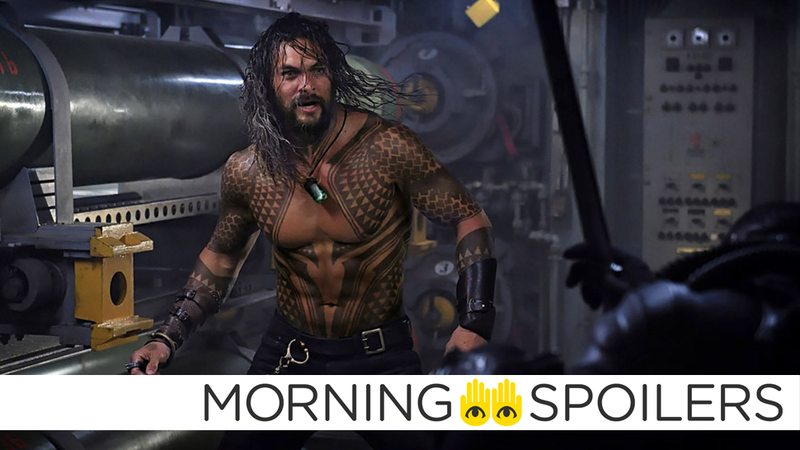 Elsewhere, director James Wan shared a screenshot of Aquaman summoning a whale from the upcoming trailer. Keanu Reeves ride a dark horse through Manhattan in a new set video. One way to beat traffic, I guess. Coming Soon has character posters of each Hundred Acre Wood inhabitant. Click through to see the rest. Here’s a second U.S. trailer for the Brazilian werewolf movie, Good Manners. Entertainment Weekly reports Leighton Meester will guest-star in an episode of The Orville’s second season. In a new interview with Entertainment Tonight, Danielle Panabaker revealed she’ll be directing an episode of The Flash’s fifth season. I am so humbled by this opportunity to utilize everything that I have learned as a storyteller to bring an episode of The Flash to life. I couldn’t be more thrilled to have the chance to work alongside our extremely talented (and vast) team that works so hard to make each and every episode of the show. I wouldn’t be here without the support of my Flash family, and I am so thankful for this opportunity to continue to grow and challenge myself as an artist. Coming Soon has images from Hulu’s upcoming Mars drama from the creator of House of Cards, starring Sean Penn, Natascha McElhone, Oded Fehr, James Ransome, LisaGay Hamilton and Hanna Ware. More at the link. Entertainment Weekly has new images from the second half of season four. Click through for more. Black Lightning heads to Comic-Con in a new teaser. Another teaser has the cast of the Charmed reboot taking a road trip to San Diego Comic-Con.